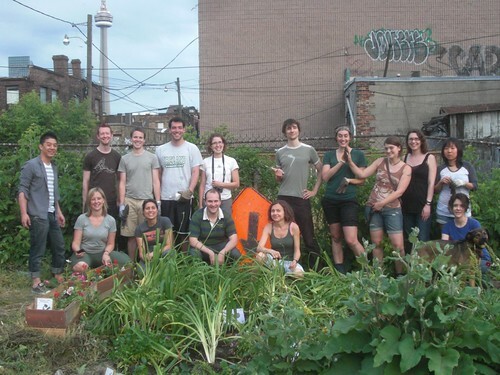 Yesterday was the summer solstice and the final planting of the year for the Toronto Guerilla Gardeners. I was the downtown plant coordinator for this year, which basically meant that it was my job to find a spot to garden downtown. It took me quite a long time to find a spot - I spent awhile on google maps before deciding that it was almost impossible to tell when a spot "needs help" from a satellite view. So then I started taking walks around the downtown, keeping my eyes open for spots - and for the longest time I didn't find anything. But then, I started seeing things, and before long, I was seeing spots everywhere - it turns out, I had kind of a mental habit that made it hard to see blight - I think a lot of people are like this this. After you've said no enough time to bums asking for money, you kind of tune it out of mind, and the same thing is true for the little ugly-nesses of the city. But once you start seeing them again, they are surprisingly common. Anyway, I found an abandoned plot of land that is nearly house-sized only about 2 blocks from where I live, just off Spadina at D'Arcy. It's a huge area and we can't hope to garden it all, but we did manage to make a HUGE difference! It went from being a bunch of weeds to being a super nice garden of 1,000 lillies, plus some annuals and a sampling of native plants (like burdock) that we left in place. There was a huge turn out, thanks to KT's genius call for backup ("Wow that's horrible... so obviously we need as much help as we can get"). We had a photographer from a gardening magazine out to shoot us at work (story to follow in a few months, I'll link it when it comes out), plus a busload of Chinese tourists snapped some pics as well. Much fun was had by all - it's amazing how the heavy going work of soil prep gives way to the fun of planting and then it's suddenly time to clean up and do a group photo! The restaurant owners next door also kindly lent the use of their water facet, and were very supportive in general, I think we just made their week :-). A gentleman from the nearby taichi society also stopped by and told us that the area we were working on had been ugly and abandoned ever since he'd moved in, over twenty years ago! Wow it feels good to make a difference like that! We also filled some planters with soil and marched them to a second site, at Spadina & Sullivan, about 3 blocks south. The owners of the Pho restaurant there were also super enthused to have the little eye-sore yard next to their restaurant fixed up so pretty! Anyway, thanks to everyone who came out, and hopefully we can return to this plot in future years to get the rest of it as well! See my flickr set for all the awesome (including some shots from well over a month ago, those are real "before" shots :-): Guerilla Gardening: downtown plant. Oh well. I'll help water when I get back to TO.